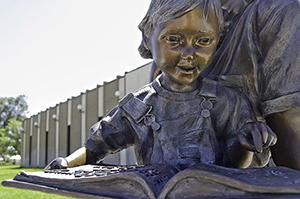 This statue, More Than Words, celebrates the simple joys of reading as a family. What could be more appropriate placement for this statue than in front of the Goodland Public Library? 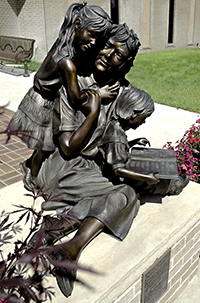 Statue was erected in 2004 by the Senior Housing Corporation, Brenda McCants, President, and donated to the City of Goodland. Go into the library to see the mysterious Kansas Room painting and the rescued stained glass window. One of Todd's earlier works, They Came to Stay, is across the street on the Sherman County Courthouse grounds. The Central School Bell and a benchmark are near the Broadway Avenue entrance. The beautiful District Courtroom is on the second floor. Library is open September-May, Monday-Thursday 10 a.m.-8 p.m.; Friday-Saturday 10 a.m.-5 p.m.; June-August, Monday-Thursday 10 a.m.-7 p.m.; Friday-Saturday, 10 a.m.-5 p.m. Mountain Time.